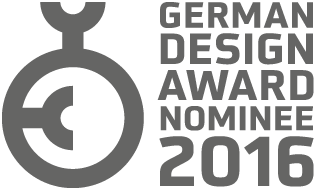 that's our main focus at animaux. When your dog is with you, you feel great! And to make sure your dog also feels great, you’ll gladly give him something in return. Likewise, we also value your dog a great deal, which is why we develop products to strengthen him for his daily adventures. Products which can be easily absorbed into his body and which are ideally suited to his needs. We also produce food supplements for every phase of his life. Teeth and dental hygiene is an important aspect of the daily care for our four-legged friends. dental herbs 365 supports the regulare care of teeth, gums and mouth flora with purely natural ingredients such as oregano, curcuma, peppermint, green tea, pomegranate and spirulina. All these ingredients are traditionally used in mouth and dental care for their odour-neutralising, calming and saliva-stimulating properties. Even for the most easy-going dog, there are moments that can cause stress, such as travel, thunder and lightning, a visit to the vet, or of course, if you are away from him for an extended time. 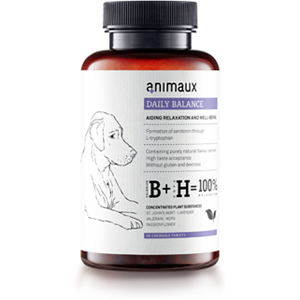 daily balance helps your beloved dog to relax in such moments and to feel better, and is suitable for whenever he feels uneasy. And you can rest easy: in this soothing preparation, we use natural substances such as valerian, hop, amber and lavender. The ingredients of our plant extract combination – valerian, hop, amber, lavender, balm and passionflower herb – are the classics of naturopathy. They have been traditionally used for centuries to have a calming, anti-convulsive and relaxing effect on the body. A balanced mood, a good night’s sleep and new vitality can help your dog to cope in tense and strenuous situations. Furthermore, neurotransmitters as noradrenaline, serotonin and dopamine are encouraged. Vitamin E (here as alpha-Tocopherol) and vitamin C, both antioxidants, protect body cells against lipid peroxidation and bind free radicals. L-tryptophan is an essential Amino Acid, which cannot be produced by the body itself. Within the body, it metabolises into serotonin, which controls the conduction of stimuli in the central nervous system. The experience will be mood-elevating, relaxing, soporific and anxiety-alleviating. Our dogs are born to explore the world – it’s in their nature. So it’s important they get sufficient vital substances. These are also of great benefit to sensitive and older dogs, due to many diseases within our civilisation and the impact of the environment, both of which can make them suffer. To help, we have put together a balanced mixture drawn ginseng and many other good things. This basis is enhanced by Vitamins A, D, E and K, which are essential for the body. Whether it be for the senses, fur and skin renewal, restriction of inflammation or to strengthen the skeleton, all four vitamins play an important role in these processes. We have also added the trace elements magnesium, calcium, copper, manganese, zinc and selenium to the recipe, to further enhance our dog’s metabolism and immune defence. Lecithin, which is also included, stabilises the cell membranes’ structure of brain and nerve cells. Many dogs suffer from indigestion – food intolerances and allergies are constantly on the rise, and a fatty and protein-rich diet often has an unfavourable effect on the digestive system. gastro balance supports the intestine’s regeneration through the strength of medicinal plants such as sage, caraway, fennel, oregano and yarrow, traditionally known for their anti-inflammatory and soothing properties. Sustained inflammation in the gastrointestinal tract may occur, which weakens an animal’s health through important nutrients being flushed out or not being fully metabolised. If long-term diarrhoea occurs, this will damage the intestine’s own immune system, leading to secondary diseases. Combined with Desert Indianwheat and flax seeds, it prevents further loss of fluid and improves stool consistency. Important electrolytes such as Calcium and Iron provide the body with energy and balance out any existing deficiencies. Through the probiotic and prebiotic effect of Brewer’s Yeast and oligosaccharides, impaired intestinal flora can recuperate, and the intestine’s own immune system will be strengthened. Desert Indianwheat and Flax Seeds bind vast amounts of liquid through their high swelling capacity. In this way, they improve stool consistency and protect against diarrhoea, and as a consequence, prevent persistent loss of fluid. Additionally, mucilage provided by the seeds coats the gastric mucous membrane with a protective layer, thus reducing irritation and inflammation. To support the body’s regeneration even more, gastro balance provides readily available energy in the form of glucose. Furthermore, electrolytes compensate for the loss of nutrients which often comes along with indigestion. 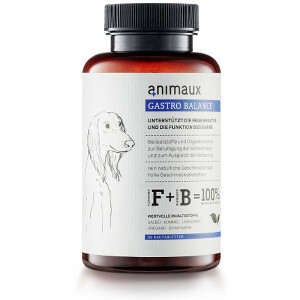 To strengthen a dog’s immune system, gastro balance contains oligosaccharides, which are only digestible by bacteria present in the colon. In combination with Brewer’s Yeast (containing living yeast bacteria), it promotes the growth of healthy intestinal bacteria and stabilises the natural immune system of the intestine. It also avoids the formation of new infections and fundamentally strengthens the body. These days, our dogs also have a longer life expectancy. This, of course, makes us happy! However, like us, they also increasingly suffer from aching joints or a painful musculoskeletal system. Unfortunately, we usually realise it only very late that they are in pain, often at a time when the disease already has considerably progressed. Besides this, many dogs also suffer from illnesses like hip dysplasia congenitally. Different plant extracts (Wilow bark and Phyteuma) are enhanced by vitamins and L-Carnitine in a perfectly balanced combination. 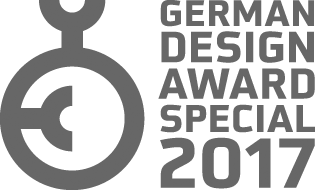 Following the example of nature, the formula's composition promotes the interplay of the selected vital substances. As a result, all nutrients will be absorbed by the dog's body in the most efficient way. The joint cartilages and tendons will get a balanced supply of aiding nutrients, and your dog will once again have fun moving. For thousands of years, willow bark has been used as a natural remedy for both pain and fever. From salicin, one of its active ingredients, salicylic acid is produced and forms, even today, the basis of the commonly used painkiller acetylsalicylic acid. In Africa, Devil’s Claw (harpagophytum) has traditionally been used to relieve pain. Its active ingredients are contained within the root. In laboratory experiments, anti-inflammatory and analgesic effects have been observed. These medicinal plants are combined with glycosaminoglycans (GAGs), which are extracted from the New Zealand green-lipped mussel. The organic substances hyaluronic acid, glucosamine and chondroitin are used to ensure that cartilage, ligaments, tendons and connective tissue can continuously build and degrade. Glucosamine is an amino sugar, which serves as a raw material for the entire connective and supporting tissue, skin and the arterial walls, and as such is of vital importance. Vitamins C and E, as antioxidants, are able to bind to free radicals and protect important metabolites and genetic material. This is especially important if the dog is already stricken by pain. Furthermore, we have added the essential amino acids carnitine, methionine and lysine. These cannot be produced by the body itself. As such, an adequate intake from external sources is of considerable importance, especially as these amino acids are concerned with energy metabolism and play a key role in the regulation of lipid metabolism. Cats – often in motion and very active. Therefore, the natural protective mechanisms of their immune systems are particularly prone to stress. Our formula combines the most important vitamins and specially selected trace elements to help maintain overall health. As they are present in an organically bound form they ensure optimum metabolic availability. Vitamins A, D, E and K are essential for healthy animals. Whether it comes to the renewal of the fur and skin, the prevention of inflammation, the proper function of the senses or ensuring healthy bones in our animals, all four are vitally important. B vitamins play a pivotal role in many processes of cell metabolism. Without them, carbohydrates, proteins and lipids are not metabolized properly. These essential vitamins also support nerve, skin and muscle function and contribute their share to the continual regeneration of the body. 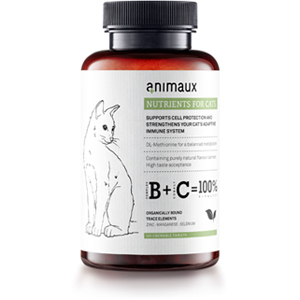 We have added all eight B vitamins to the recipe, combined together in a meaningful way to maximize the benefits for your cat. 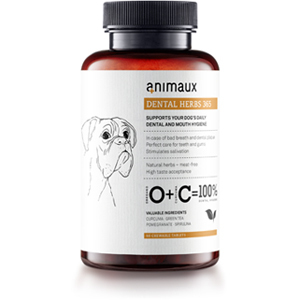 Furthermore, to support the metabolism and to help ensure a healthy immune system protecting your pet, we have included the trace elements manganese, zinc and selenium. Taurine is also added; it stabilizes the structure of the cell membranes of the brain and nerve cells, and is an important basis for a well-functioning metabolism. nutrients for cats enhances the performance potential of your cat in every life situation and in a completely natural way. A dog that can stay fit throughout his entire life: this concept lies at our heart and inspires us to find new ideas to support him to stay active and healthy. 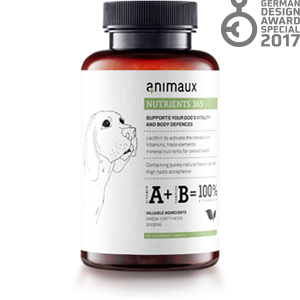 Nutrients for pets that are meaningful and can really support help our dogs feeling good - that's our main focus at animaux. We develop products which enrich our dogs because our best friends enrich our world; we want to give something back to them of everything they give to us. This brand originates from the same house.